When you are involved in a road traffic accident there are a number of things you must do, both by law and common sense. Clearly the first thing to do is to identify if anyone is injured, or if an animal had been involved and injured, and what damage is immediately identifiable. It is also wise to bear in mind that what you do at the scene of the accident could affect any issues related to road accident compensation claims. Legally, it is an offence if you fail to stop when you are involved in an accident if anyone is injured or any damage is caused. It is also an offence if you do not report that accident. You should always report an accident to the police. Immediately after the accident you must remain at the scene for what is called a ‘reasonable period’. Then both you and any other driver involved must exchange details; these will include details of insurance held, names, and addresses. If anyone else is involved but was not driving a vehicle, then they also have the right to ask for these details and should provide their own. If these details are not exchanged at the scene of the accident then they must be reported, along with details of the accident, to the Police at the earliest opportunity, and certainly within 24 hours of the accident having occurred. If you do not report the accident or provide your details, you will be breaking the law and can, if brought before the Courts, be found guilty of either one, or both, of two offences: failing to stop and failing to report details. Penalties for both of these offences separately can include a fine of up to £5,000 and the imposing of 5 to 10 penalty points. A prison sentence of up to six months can also be imposed. In the event that no one is injured, you must still provide details of your insurance and personal details, even if you believe that you were in no way responsible for the accident. If you do not provide these details either at the site of the accident or at a reasonable later date, then you will be committing an offence. 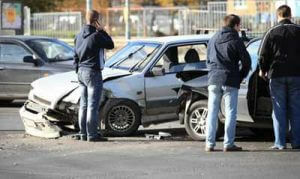 After the accident you should undertake an assessment as to whether any medical help is required. Following this you should assess whether or not one or any other of the vehicles or property involved is liable to pose threat of causing a further accident, for example if a car is at a partially obscured part of the road, or wreckage or other debris, or indeed a vehicle, are in the road. Make sure that vehicles involved are secured – in other words, that the engines are switched off and they are secured by handbrakes. If you are involved in an accident that does not involve another vehicle but does involve property, for example a fence or some other object, then you should try to establish to whom that belongs and again provide them with your personal details and details of your insurance. Even if you are tempted to do so, it is advisable not to discuss details of the accident with anyone other than the police; this way you will not be entering into debate or interpretation of the facts. These may well be disputed at a later time either between insurance companies, or in the case of any legal action resulting from personal injury for example, the Courts. This entry was posted in Road Accidents on 22nd April 2016 by pinnacleadmin.